Developed Markets Fall- In the month of May, developed stock markets in the aggregate fell by 1.90%. The U.S. and Canada recorded gains of 2.37% and 1.97%, respectively. A bounce back in the technology sector was a tailwind for the U.S. equity market. Europe ex UK had a volatile month, falling 4.23%. China and Russia Record Gains– Broader emerging markets dropped 3.63% in May. China and Russia posted modest returns of 1.84% and 1.13%, respectively. Brazil and Mexico fell the most. Over the past year, emerging markets are up 12.2% compared to the 8.33% of developed markets. Relative valuations still favor the developing nations. Information Technology Bounces Back- Information technology and industrials posted gains of 5.70% and 1.31%, respectively. Telecommunications and financials dropped the most in May, pulling back 5.54% and 3.88%, respectively. 2018 has favored those sectors that typically thrive during the late stages of the business cycle. Size Premium Positive in 2018- In May, large cap value was flat for the month. Small cap value companies recorded gains of 5.82%. Momentum was positive in May. The size premium has been positive so far in 2018, a change from the five and ten year periods. Investing in smaller companies has historically compensated investors for taking on the added risk. Growth Outperforms– In the international developed markets, growth outperformed value for the month. Momentum posted a loss of 0.84%, but performed well over the past year. Smaller emerging market companies fared better than their large cap counterpart. Unlike domestic equities, international equities have seen a positive size premium over the past five and ten years. Savers Benefit from Rising Rates– Money market fund and T-Bill yields still trail the CPI, but savers may benefit more as the Fed continues to raise rates. The CPI increased by 0.85% through the end of April and increased 2.43% year over year. Increased trade tensions could bring more inflation to the U.S. 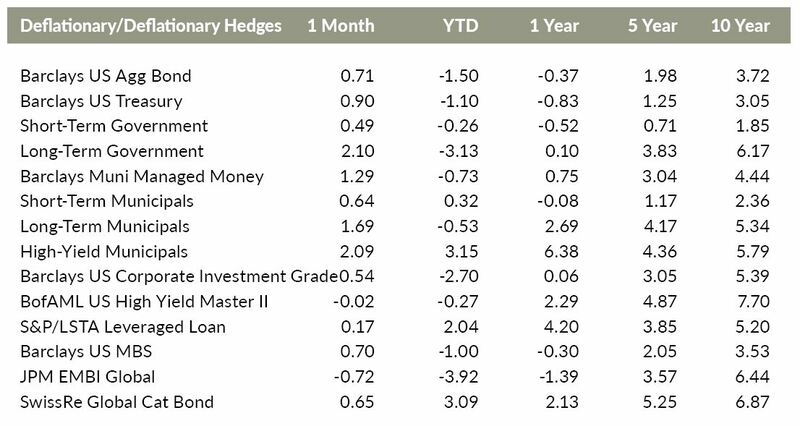 Fixed Income Mostly Positive in May– The returns of deflationary hedges were mostly positive in May. High yield municipal bonds and long-term government bonds recorded solid gains. Emerging market bonds and U.S. high yield dropped slightly. Traditional fixed income will face headwinds as central banks continue to tighten and rates rise. U.S. REITs Post Strong Month– Inflation-sensitive investment returns were mixed for the month. Natural gas and the Alerian MLP recorded gains of 5.60% and 5.05%, respectively. Crude oil and infrastructure were down for the month. U.S. REITs bounced back following a tough start to the year. While gold has been flat, the metal may prove to be a valuable portfolio diversifier as the fiscal positions of many developed countries deteriorate. U.S. Dollar Appreciates– Over the past three months, the U.S. Dollar appreciated against most other major currencies. The Euro and Swiss Franc dropped the most relative to the U.S. Dollar. Over the past year, the Euro and Chinese Yuan have strengthened moderately against the U.S. Dollar.